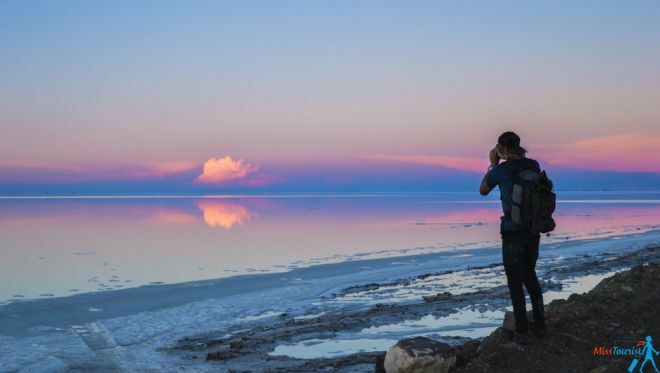 Even if you know nothing about the famous Bolivia salt flats, I am sure you have seen some remarkable reflection pictures from the salt plains, didn’t you? That is because Salar de Uyuni is one of the most famous tourist sites in Bolivia! I have recently done the 3-day tour of the salt flats in South America, Bolivia (Salar de Uyuni tour) and here are some useful tips on how to choose the best tour and exactly how much it will cost you. These ideas will make you want to go there as soon as possible: 20 Creative Ideas For Your Bolivian Salt Flats Photos! 1. What Is Salar De Uyuni, Bolivia? 10 BILLION tons of salt! Can you imagine? Salar de Uyuni is the world’s largest salt flat, let’s get this out of the way from the beginning. “The place where Heaven meets Earth” they call it. Yes, guys, those people did not exaggerate, it is out-of-this-world beautiful! What is a salt flat? 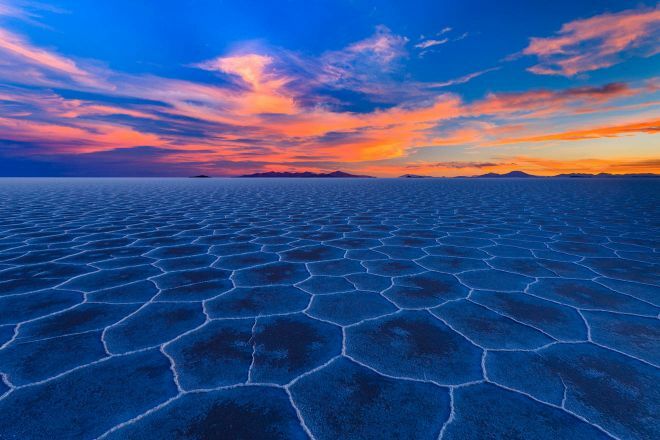 Millions of years ago, there was a huge Bolivia salt lake there, it dried up, and now it is the biggest salt flat in the world, which also becomes the largest reflecting surface during the rainy season. Salar de Uyuni’s surface is 10.5 km long (more than 4.000 miles) and its altitude is more than 3.500m (12.000 feet) above the sea level! The best (if not only) way to see it is to take a 4WD tour with 5-6 other people in the car. There are different tour options – for 1 day, 3 days or 4 days, which we will be talking about below. 2. When is the best time to visit Bolivia salt flats? You know what, when I went in January, I didn’t even double check if that was the best time to go. When it is not raining you will get to see a wide terrain with beautiful, intricate dry salt shapes, so this place is beautiful all year round! The best time to go really depends on your preference of what you want to see. Most people say it is best to go from May to November when the weather is mild, but keep in mind that the Bolivian salt flat plains will be dry. The wet season is from January to April. The rain will make that beautiful mirror effect, an unbelievable image of infinity. I went in January and even if most of the salt flats Uyuni were dry, we found a place that allowed us to see the reflections. So I had a 2 in 1 experience! But honestly, any time of the year is truly spectacular. Any month you choose, you will not regret your choice! 3. How Many Days In Bolivia Salt Flats Are Enough? While it is possible to do a 1-day tour, 3-4 day tours that head deeper in the Altiplano are more popular (and recommended!). 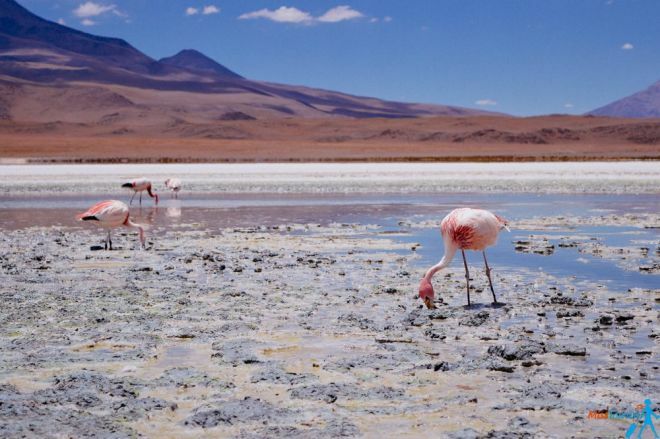 What I particularly don’t like about the 1-day tour is that you don’t see this surreal place at sunset and you also don’t get to explore its other magnificent parts other than the salt plains– such as the flamingos, volcanos, hot springs and more! I took a 3-day Bolivia salt flats tour, which is basically a 2-day tour as you finish at 8.30 AM in the last day (but you will wake up at 5 AM). Because Uyuni is located at a higher altitude, I would recommend staying in the city for at least one day before the tour – this way you will get used to the change and the smaller quantities of oxygen. 4. Where Do Bolivia Salt Flat Tours Start? 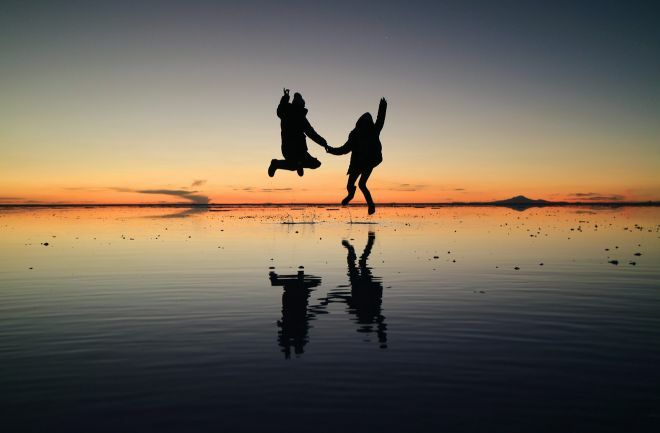 1-day tours usually start in Uyuni, a little town located very close to the salt fields in Bolivia – this is the most popular and cheap starting and finishing spot for the salt flat Bolivia tour. If you are coming from Chile, you can start the tour in San Pedro di Atacama and finish in Uyuni (the other way around). Expect to pay more in this case (Chilean prices, you know 😉 ). Start in Tupiza – this is the least popular option and these tours usually last 4 days. You will start from the Southern part of the salt flats and do the itinerary in reverse. At the end, you can return from Salar de Uyuni to Tupiza. You can even start in La Paz or Sucre if you want a short private one-day tour. The most popular starting point for the salt flats tour is Uyuni and this was my choice too. Uyuni is a little town living out of tourism, basically. Budget option: The night bus from La Paz to Uyuni is around 8 hours long and it will take you there at 5-6 A.M. They said it’s going to be bumpy, but I would say it was really not that bad. The price is about 25 US$. You can check the schedule and the up-to-date prices on TicketsBolivia. If you wish, you can stay for one more night, just to relax and make yourself comfortable with the altitude. I was feeling fine after the bus ride, so I did not want to wait. Comfortable option: You can fly to Uyuni, as it has a small airport. The approximate price is 80-100 US$. You can even book a private day tour from La Paz if you are short on time and prefer this option. You can get a direct bus from Sucre (Bolivia’s capital) to Uyuni salt flats and start your tour there. The ride will take about 8-9 hours and the approximate price is 11 US$. Buses run daily and you can check the schedule and prices on TicketsBolivia. 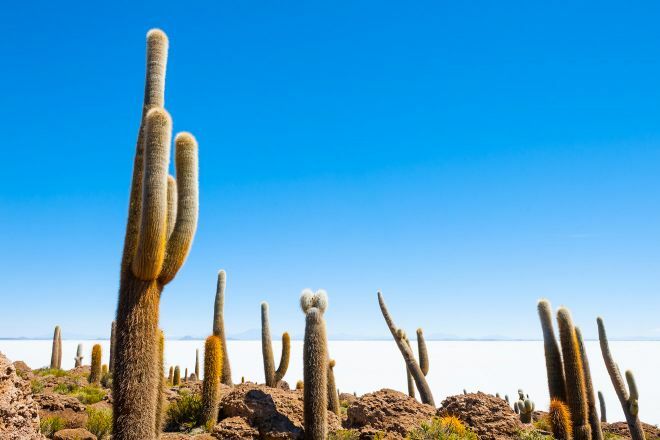 If you want, you can book an organized 1-day tour from Sucre to Uyuni salt flat. At the end of the tour, you will return to Sucre. 6. 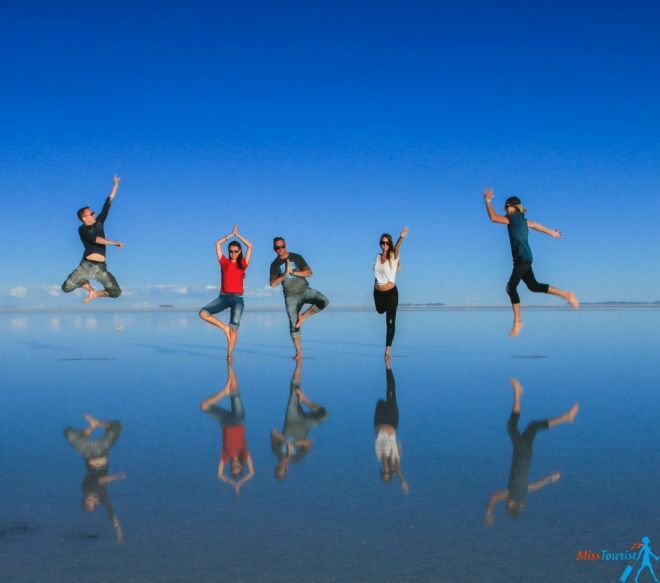 How To Choose Your Uyuni Salt Flats Tour? 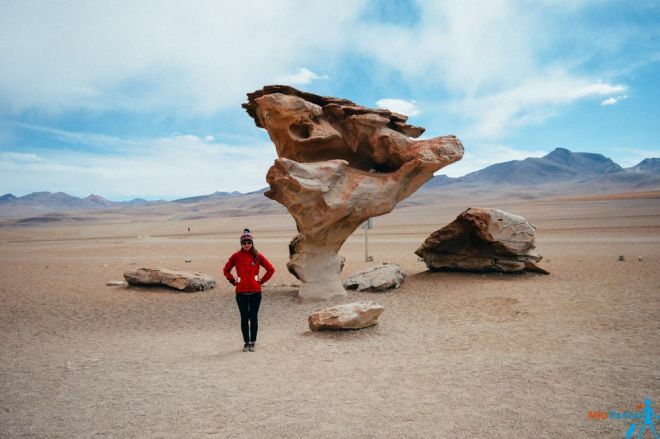 Please keep in mind that Uyuni is a very standardized tour. Everyone there will offer you exactly the same route. They will try to increase the value of the tour (and, hence, the price), saying that the food is better/the driver is faster, but believe me, it is all the same in the end. How many people are there in the car? – the less, the better, of course, but it is usually 6 people + driver. Does the driver speak English? – ours didn’t speak a word in English, but my Spanish was good enough to understand the meaning :). Where does the tour end? Do you come back to Uyuni or do you continue in the Atacama Desert in Chile? – most of the times this is your choice to make. Is the entrance to the National park included? – Usually, no. The entrance is an extra of 150 Bob (22 US$). You also need to pay extra to visit the “Fish Island” within Uyuni salt lake. There is usually no problem to just show up on the tour, as they are formed on the first come, first serve basis. Most probably your guide will be 3-in-1 – a driver, a cook (the food was good, by the way) and an organizer. If you don’t speak any Spanish, this is what I recommend – make sure someone in your group understands at least a bit, and he will translate you the main things. If not, well, you will use the body language, and the tour is mostly about seeing things, not a guided excursion. Everything that my guide told me (not that much to be honest), I could have easily read in Wikipedia here. PRO TIP: Ask your driver to stay for the sunset in the salt plains and insist on it if he wants to leave. Our best pictures were taken during that time of the day. Make sure to talk about this when you book the tour. 7. 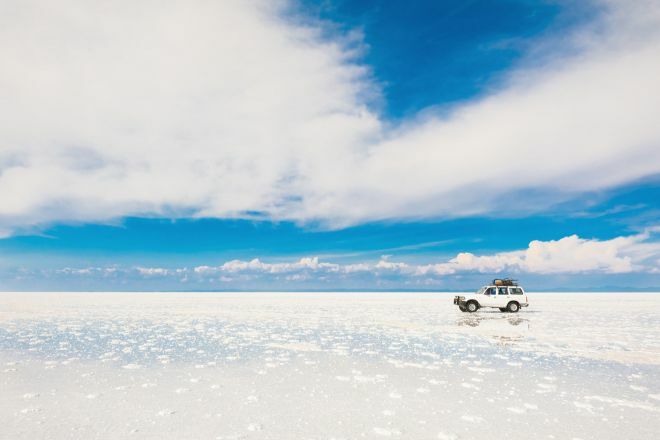 How Much Does It Cost To Visit Bolivia Salt Flats? The tours offer ABSOLUTELY the same itinerary, the difference is the company and the price you will negotiate (see prices below). My friend, prepare to bargain a bit! The usual price is 700-750 Bob for a 3-days tour (100 – 110 USD). 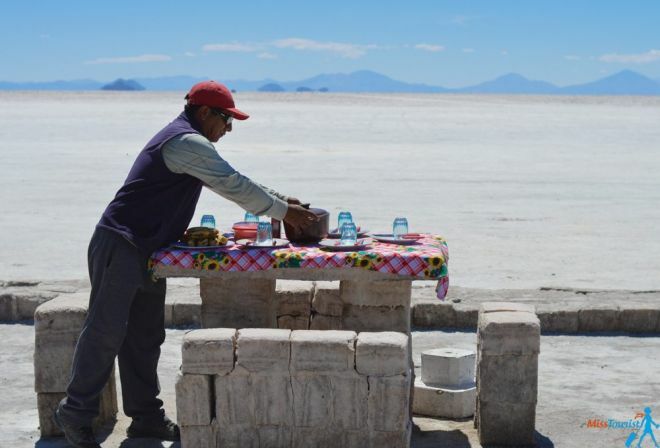 The sellers in Uyuni will try to convince you that they offer better food or more experienced drivers. The truth is, the tours are exactly the same and I see no reason paying more than 750 Bob for the same service. The price includes everything – transportation, food, and accommodation. Don’t forget about the extra ~20 US$ for the National Park entrance. And, in case you are going to San Pedro de Atacama after, there is an extra transfer payment for the border (50 Bob). You can usually pay this in advance when you book the tour. Please note that this is the price for a Spanish speaking driver. If you want a tour in English, you will have to pay double – 1300 – 1500 Bob (or about 220 US$) per person. If you will take the same tour from Chile, it will be more expensive. 8. 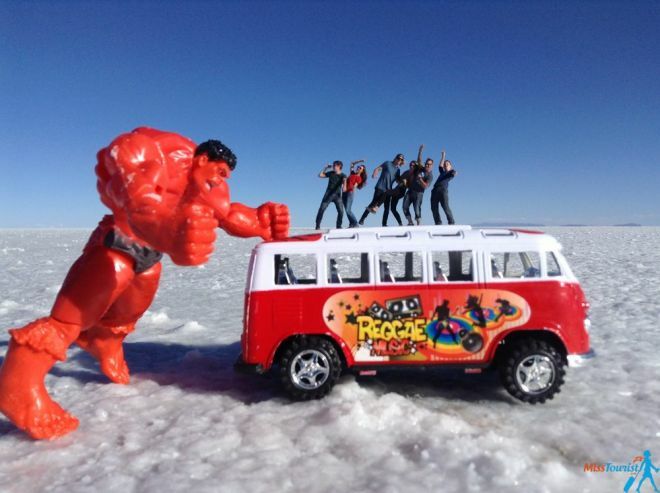 What Will You See In A Bolivian Salt Flats Tour? Even if the salt flat will surely be the highlight of the tour, it is only the first day of your trip. What will you see in the other two days? Endless rocky desert, colored lagoons, pink, white and black flamingos, geysers belching sulfur, sleeping volcanoes (smoking sometimes), hot springs, cactus-covered islands, a train cemetery… and many more things! I am not posting the itinerary here on purpose, as I would like you to get surprised and astonished by the amazing sceneries that you will see! What Are The Accommodation Options In Bolivia, Salar De Uyuni? We stayed in a salt hotel on the first day (hot shower was an extra payment of 10 Bob) and in a nice refuge (at over 4000m altitude!) on the second night, where all 6 passengers from our jeep shared a (big) room. The salt hotel in Bolivia was pretty cool – the tables, chairs, beds – everything was made completely out of salt. Even the building itself was made out of salt bricks! How cool is that? The accommodation did not have much to offer in terms of amenities (but hey, you are in the desert in the middle of nowhere), but it is clean and nice. So, great experience! If you decided to stay in Uyuni overnight before or after your Salar de Uyuni trip, the best place would be the town of Uyuni, as that is where the tours start from and finish to. Luxury (US$ 150 and up): Cristales Joyas De Sal is an amazing 4-star hotel with great decor and facilities. My second suggestion is Casa Andina Salt Hotel, made of salt and with very nice decor details! Each room is fitted with a private bathroom, a seating area, a dining table and more! Middle (US$ 50 – 100): For people who travel to Bolivia searching for middle-priced accommodation, I can recommend Hostal Quinua Dorada – very clean and the staff is super friendly! A second option could be Las Tholas Hotel which is a super nice 3-star hotel with tidy rooms and private bathrooms that have everything you may need for your stay there! Budget (up to US$50): KW Hotel is a great budget option that will await you with a good buffet breakfast, flat-screen TV and private bathrooms. Another amazing option is Onkel Inn Wagon Sleepbox Uyuni – it has very good accommodation options, a nice terrace and a shared lounge where you can relax and unwind. 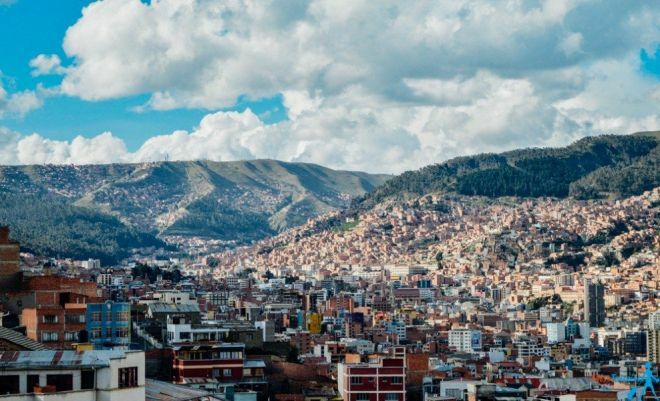 La Paz is not the capital of Bolivia (it is Sucre), but La Paz is bigger than the capital and it is an international hub where you will stop by before the Salar de Uyuni tour, most probably. It makes sense to stay in La Paz for a day or two to accommodate yourself to high altitudes, as the city is 4.000 meters above the sea level. When I travel, I love staying in apartments, but I also like the service of a hotel. 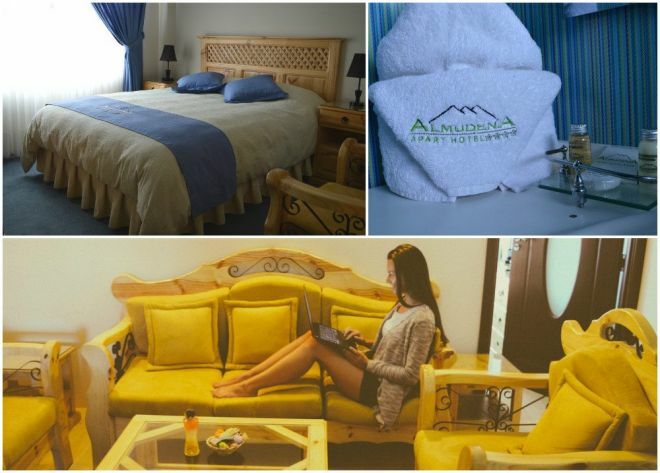 So, when I browsed the options, I found Almudena Apart Hotel and decided to stay there. You will have the best of what a hotel can offer in Almudena – delicious buffet breakfast every morning, 24-hour front desk, a cleaning service. But at the same time, you have that feeling of home which I was nurturing for a long time after so much traveling. You have your own apartment with a living room and even a kitchen. The kitchen had all that I needed – bonus a kettle (I love tea!). I found there the comfort which I needed after my long trips around South America. I stayed for 3 days just to simply relax! I would recommend staying at Almudena. They have fast Internet connection unlimited coca tea, and the privacy of your own apartment – I could not ask for more! Check the rates/book the hotel here! Luxury (US$ 150 and up): Atix Hotel has a unique design and is home to the finest cuisine in all of La Paz. Guests have rated the staff as professional and courteous. Casa Grande Hotel has rooms with balconies that offer spectacular city views. Guests can also benefit from the Spa services. Middle (US$ 50 – 100): Hotel Rosario La Paz is the to go place for anyone who wants to experience true Bolivian food and design. Casa Fusion Hotel Boutique has its name speaking for it. It is a fusion between modern and classic Bolivian architecture and an overall wonderful place to stay. A torch (useful, but not obligatory). In case you are going to Atacama desert afterward (like me) – you will have to put your main luggage on the top of the jeep and a backpack with what you need for these 3-4 days with you in the car. Forget about staying online for those days. There will be no phone signal and no Internet connection (reminder – you will be literally in the middle of nowhere). On day 3, though (right before we crossed the border), there was an opportunity to use an overpriced Wi-Fi (20 Bob for 15 mins). 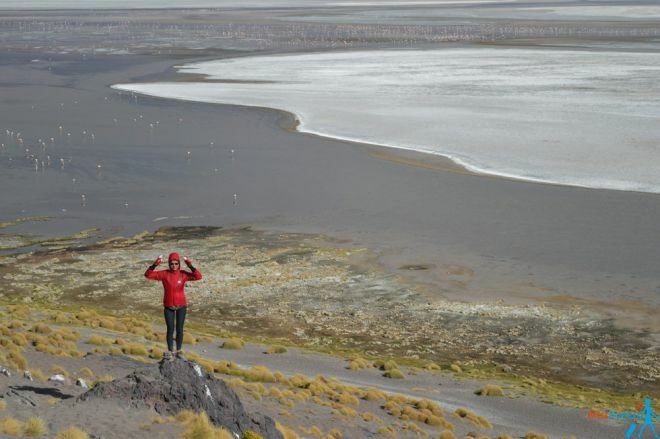 What is the Salar de Uyuni altitude? The altitude at Bolivia, Uyuni is more than 3.500m (12.000 feet) above the sea level and, believe it or not, during your trip you will climb even higher! For example, at Laguna Colorada, in the Eduardo Avaroa National Park, the altitude is 4.800m (15.700 feet). 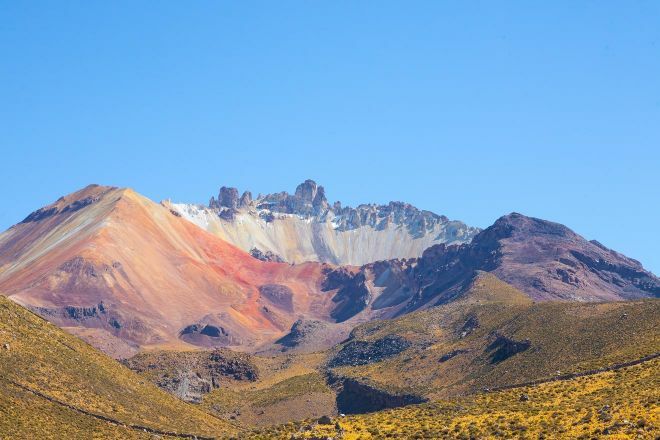 This is why I recommend taking at least a day in Bolivia before your trip – this will help you get used to the altitude and the lower levels of oxygen in the air. Make sure to drink coca tea, don’t eat heavy things and get some rest. How can I make sure I get the best seat in the 4WD tour? Given the fact that this is a collective experience in a beautiful salt desert in Bolivia, my honest advice would be to swap places with the other people in the car after a while – maybe 3 times a day, every 3 hours – this is your choice as a group. That’s what we did and no one seemed to mind. This way everybody will be able to see the amazing scenery from the car window and nobody will get upset. No, most of the drivers will only speak Spanish. If you would like an English speaking driver you can book a private tour, such as this 1-day tour from La Paz. Even though the weather is nice during the day, at night it will get cold. Don’t forget to bring some warm clothes. If you are still concerned, you can take your own sleeping bag with you or rent one from your tour operator (ask about that in advance). Will I have electricity or special places to charge my phone? Considering that you will be in a group of people in a very remote place, you must keep in mind that the electricity at the accommodation during your trip might not be enough for all of you. I suggest to not risk any photo opportunities (trust me, you will be taking TONS of beautiful pictures of salt plains!) and bring an external battery during your trip so you can recharge your phone and/or camera. You won’t regret it! I remember we could use an extended plug in one of the hotels to charge our phones though. Will I have phone signal and/or internet connection during the tour? If you REALLY need internet, there will be a place where you will stop for lunch on the 2nd day with paid Wi-Fi. Are there any restaurants or shops nearby? You will be in a very, VERY remote place with no restaurants, pharmacies or shops nearby. The tours are all-inclusive and they provide all the food you need (and the food is good, I must say), but you have to make sure to bring everything you may need with you (such as painkillers or other medications you have to take etc). Tip: If you have any dietary requirements or food intolerances (you are gluten-intolerant, vegetarian etc.) please tell the tour organizers beforehand and discuss all these details with them in order to avoid unpleasant surprises. Do I need cash or can I use my credit card? You will mostly need cash during your trip. Please note that the entrance to Eduardo Avaroa National Park (150 Bob/22US$), the hot springs (6 Bob/1US$) and the Fish Island (30 Bob/4.4US$) are not included in the price of the tour, so you will need to have cash in local currency for these. Although there are some ATMs in Uyuni, I wouldn’t rely on these and I would make sure I have the cash beforehand. Better safe than sorry, right? 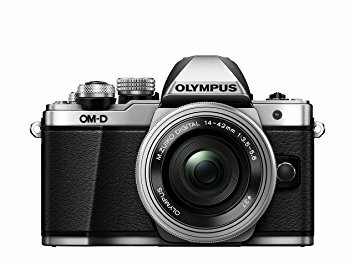 Tips and tricks for taking the best photos at Bolivia salt flats? If you planning on going on a Salar de Uyuni photography tour (you will be taking many pictures even if you plan on it or not), the only advice I can give you is to be creative and take as many pictures as you can – this way you will have plenty of good pictures after you make the selection. Don’t forget to bring extra batteries for your camera! If you are searching for some inspiration, you can take a look at these Bolivia images and check out 20 creative ideas for your Salar de Uyuni pictures! Salar de Uyuni is one of the most surreal places I have been to in my life! If you are visiting South America, try to make your itinerary so that you visit the Uyuni salt flats Bolivia, as it is one of those unique places you have to see at least once in your lifetime! 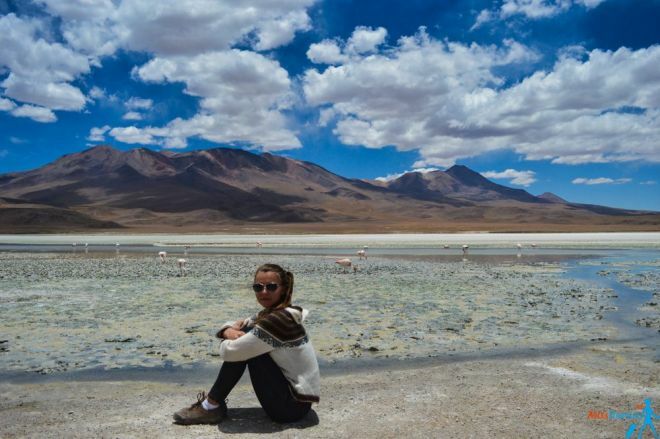 We spoke about the essentials of the Salar de Uyuni tour, how much exactly it will cost you, how to choose the best tour and how to get to the place, as well as when to go, how long to stay, and many other useful things for your trip. I also tried to answer some of the most common FAQs about Salar de Uyuni tours at the end of the article. If you still have some additional questions about the amazing Bolivia mirror lake, please leave a comment below, I will be happy to answer and update the article with further information! I hope you will have lots of fun during your Bolivia holidays! Going to Chile next? You should try some of the best wine tours there! Awesome, this is something we are planning on doing when we go to South America after the New Year! I have pinned this and bookmarked it for future reference! Thanks for all the great tips! I’m headed over in a months time and love the writeup!! What time did you get back to Uyuni from the tour? I’m looking to take a 2015 flight out of Uyuni back to La Paz and wanted tom ake sure I could make it. I was not actually back to Uyuni, I continued my journey to Atacama desert in Chile. But I think if you would go back, you would be back by 1-2 p.m.
Hi, great article, can one start in Uyuni and finish in Uyuni after the 3. Day tour? And would you suggest to book the tour in advance? Yes, you can totally finish in Uyuni as well (see in the post above). In that case you do not need to book in advance, your tour is pretty standard. Lovely post and very easy to read! Great pics too! I was wondering if you know if the tours usually include accommodation? I read online that it’s totally fine to book a tour once you reach Uyuni, but a bit worried if I will be able to have a hotel to stay, or if it’s better to book the hotel in advance? The tour included accommodation during the actual tour, sure, but you need to take care of your hotel in Uyuni if you wish to stay there overnight (i didnt). This is great. Do you think you can self-drive around Uyuni and the flats, geysirs, etc? If so, does it make sense to rent a car in Sucre? Do you know about getting from Chile to Bolivia by plane? I am pretty sure you don’t want to rent a car and drive by yourself in Bolivia, especially the salt flats. Except the fact that you are not allowed (it’s a national park and you need a special permit), you will probably get lost in 20 minutes, there are no roads, no signs, no phone signal. There are plenty of good planes or premium buses linking Sucre, Uyuni and La Paz. From Chile to Bolivia you can get by plane, just check my resource page and use kiwi to find the cheapest route. the tours offered in Uyuni are completely identical as I said in the post, you will get the same service and the itinerary. The only difference is the price (depending on how you negotiate) and the amount of people in the car. Thank you for your throughout information. You said “even if most of the salt flat was dry, we found a place that allowed us to see the reflections.” Which tour did you hire? They search the water for the passengers? I am afraid that I may have similar situation because I will go there in April, while the rain season is mostly in Feb and March. The drivers usually know where the water is because they did the same route a couple of days ago. There is no difference which tour you will choose (unless you take an exclusive private tour but I know nothing about those) because they all go the same way. You will see caravans of jeeps taking the same route. They also communicate by the phone which particular place to go to if there is not enough water. hey Amanda, thanks so much! I have been in late January and there were many flamingos! And yes, you get really close so you can take an amazing picture especially if you have decent zoom! Planning on visiting the Salt Flats this year and have a couple questions: I’m planning on coming to Uyuni from La Paz and continuing through Bolivia to Santa Cruz. Taking the 3 day tour back to Uyuni, does it affect the price? I can just tell the driver I want to come back to Uyuni and he will do it just like that? 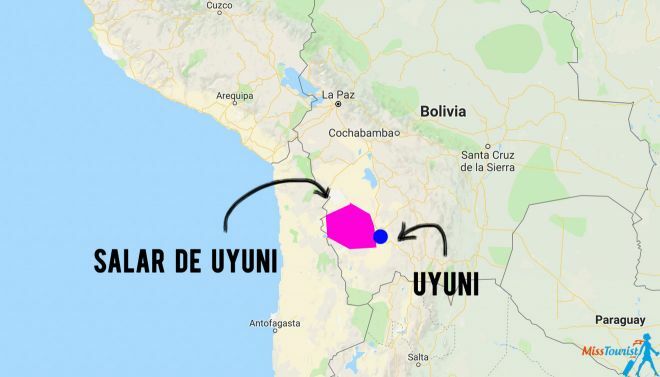 Yes, all the drivers go back to Uyni in any way and the tour was originally planned this way that it starts and finishes in Uyuni. But because many traveler (me included) prefer to continue to Atacama in Chile, there is a choice of not returning. I am planning a trip to Bolivia in June and Uyuni is my list. As I am travelling solo I would like to know if I should arrange the trip before going to Bolivia, if I should arrange it from La Paz or if it is also possible to go to Uyuni and organise it there directly joining a group. I am considering the option of doing a day of trekking to a volcano or something similar, I’ve seen online that a few companies offer it, do you know of any agency who offered something like that or if it could be easily added to the tour? As I said, I did not book anything in advance, we got it on the day of the tour. it is very easy, most of the people do it that way too! I did the most standard tour of 3 days, not sure if there is a volcano hike, sorry! i know for sure that there are 1 day tours, but there might be 2 days tours as well. If not, you can always go for a private one, they are very flexible and will organize it for you, but it will be more expensive of course. First, this post is amazing! 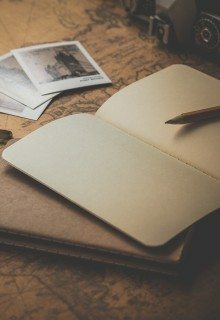 I am inspired to start creating similar posts to help people plan their own trips. Second, my girlfriend and I just arrive in Bolivia. We will probably only have 3 days and nights in the La Paz area if we do a 3 day salt flat tour. My girlfriend and I are going to La Paz this week (after Uyumi, we still need to book our tour but we fly in tomorrow and land at 1030am unfortunately so i think we won’t be able to leave tomorrow). Hi guys! sorry, sometimes i am unable to reply right away to your questions. If this is still applicable, I would probably go for an option A. There are so many things to see on lake Titicaca and the Salt flats and I would recommend to do it with no rush. I did not do the death road, but I have heard it is amazing! Hope you are having lots of fun there! Hi! I was wondering if you know a few specific tour companies that are reputable in terms of service and safety. I have heard some pretty bad stuff about uyuni tour drivers drinking on the job etc. Hello! Which tour did you go with? Any advice for which airline better for la paz ti uyuni flight? Also the 3rd day drop off to cross border to atacama what time do most tours get to the border and can you do a tour from the border of the atacama desert? I took a bus, but i think any airline would do the job, right, just search on skyscanner or such. yes, you can also do the tour the other way around – from Chile to Salar de uyuni. But I have heard those tours are significantly more expensive though. Our travel group includes one person who cannot eat anything containing gluten. Can you tell me what type of food was served on your tour? The food was simple – soups, pasta, salads, some meat (chicken), nothing fancy, our driver was cooking. In case you want to make sure they can serve gluten-free food, i strongly advice you write them in advance and double check that directly with the company. Excellent post. I am looking at flights now. I have a very limited amount of time, but I have wanted to do the 3 day tour for several years now. So, I was thinking overnight bus from La Paz, 3 day tour and then fly back. Wondering if the 8:05am flight back will be OK or if I should book the 19:10 flight, just to make sure I have enough time. Thank you so much! No, 8 am flight is definitely too early. I understand November is when Flamingos arrive for mating. Are their any specific tours for taking pictures of the Flamingo in Nov.? Do you have the name of the bus company and the tour company did you use for this trip? Thank you. are there any tours from Lap paz to that area or you have to get there ? Yes! This tour is probably what you need. Yulia, thank you for this great post. It has helped A LOT with planning my salt flat tour!! I was hoping you could answer a couple questions for me! We want to end in San Pedo Di Atacama and continue right away by bus back to Arequipa in Peru. (long travel day, I know). Did your tour company take you right to the town of San Pedo Di Atacama? Did they help with the border crossing? And lastly, do you remember approximately what time you arrived to Atacama? Thank you in advance!!! Yes, they took us right in town and it was midday, maybe about 12, but i cant remember for sure. Thank you so much for this blog! I will def be visiting here. Your advice and tips are a tremendous help. I do have a question…What’s the best way to get back to La Paz? Say for example, we fly in round trip to La Paz, just to visit the salt flats…Thanks in advance! 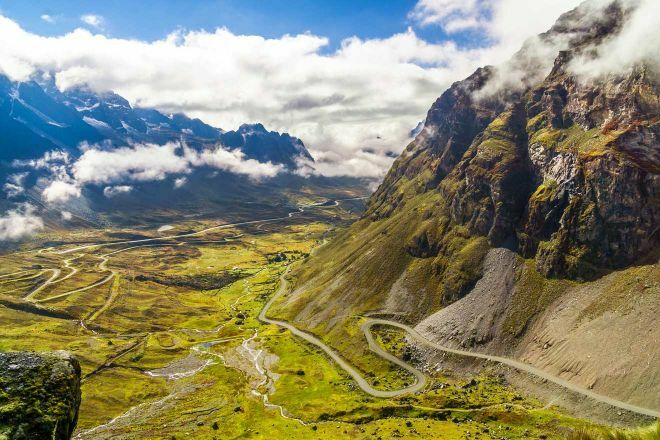 You can take a tour that includes a flight from La Paz, but I think you can also book a flight yourself (or take a bus, but this is longer) and book just the tour. For example, this is a good one. Most of them can drop you off at the boarder, I advise you to check with the tour. How many days would you recommend if you want to do both the Atacama Desert and the Salt Flats in Bolivia? I have also seen some pretty epic pictures for stargazing on the salts flats in Bolivia… would you recommend doing a stargazing tour one night? Any benefit to starting with the Salt Flats over the Atacama desert first or vice versa? I did stargazing in Chilean side, it was pretty cool! Idk, it is complely up to you on how many days you want to spend in Atacama, i spent only one (i had a really weird allergy and i had to leave), but usually people stay for 3 days i believe. We ,that is my family have planned a trip to uyuni. 1) is it possible to do day trips from the hotel and repeat them ? 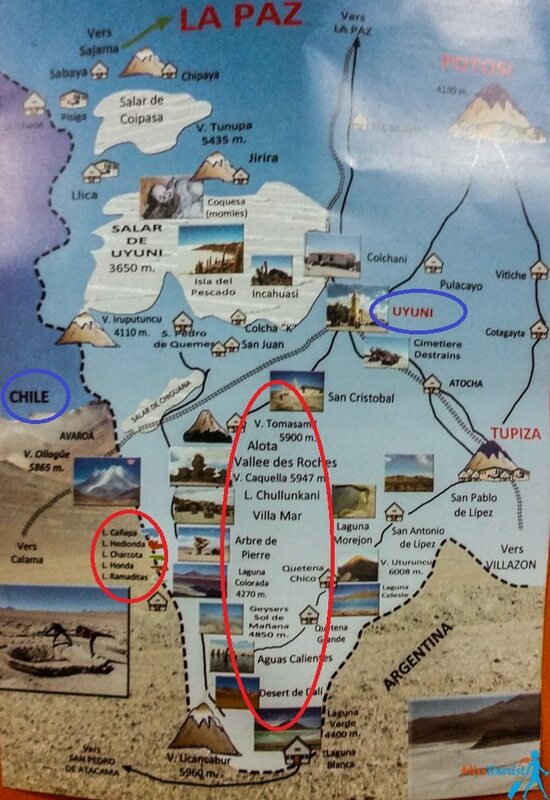 2)are there direct flights from Lima to uyuni? Wow, thanks for all your insights and tips! I was planning on booking the $200USD itinary until I read your blog! Did you remember what time you got back to Uyuni after the 3 days? I think i might be riding back to La Paz on the same day right after the tour so I can catch a plane the next day. THus, it’s cruicial I can make it back in time. I believe the bus leaves around 8pm. Thanks! I did not come back to Uyuni the last day as I continued my trip to Atacama desert, but the last day started pretty early, so I am sure you would make it back by maximum 3 pm. Make sure to mention that to your driver though so that he delivers you on time, but normally you should be fine! 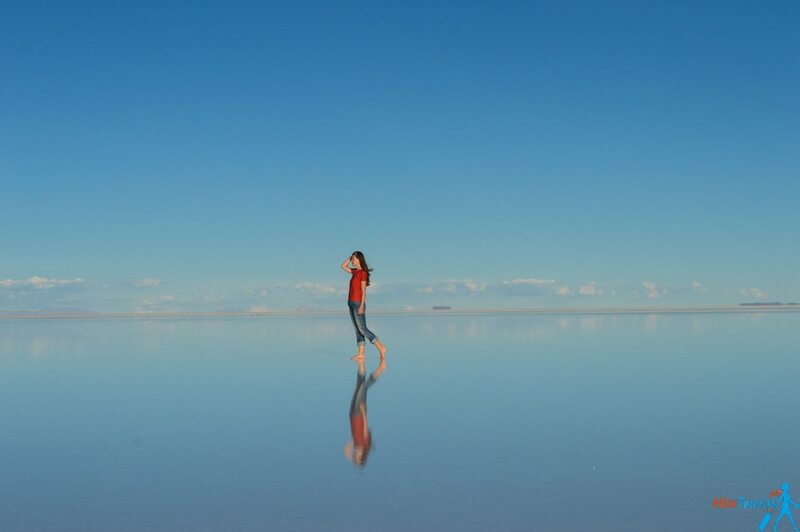 Hi Yulia, i just read your post and and saw your experienced about your travel to The world most beautiful SALT flats in Salar de Uyuni in Bolivia. I am planning with my bestfriend to visit the place, what excite me most is the mirror reflection of the salt.It’s liked most very Interesting to EXPERIENCE ,,what is the best month to visit so that we can see the mirror reflection.Thank you and more adventure to you. This was so helpful, thank you. I’m looking into the 3 day salt flat tour. I don’t need to book that in advance, right? They are about 190 USD to book in advance and I feel like I am getting ripped off that way. What do most people do? I dont know what most people do, but i belive i described in details what i have done – i booked it there. Im attempting to do Salt Flats as a private tour, was going to fly to Calama, get the bus from Calama to Atacama, do either a tour just of the salt flats area, or from atacama to sucre then fly to Santa Cruz for a few days. However, i have suffered altitude sickness before so am really nervous about stopping at Potosi due to altitude height. My passion was always just to see the salt flats. If i did maybe 1-2 day tours to the salt flats (maybe a day and an evening tour), what would be “to see” stuff. 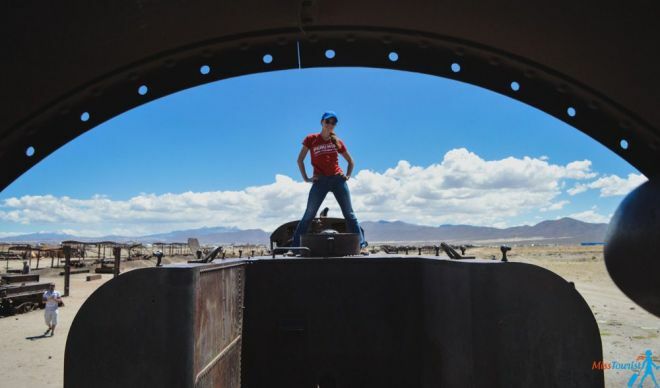 I have got train cemetery, salt factory and maybe a visit to the Salt Hotel but would like to see flamingos and the geysers. Since it will be a private tour/s, i can ask to add in bits, is there anything else i have missed? I have had altitude sickness before (although brought on by a chest infection) so this time plan to hire a portable oxygen machine from here in NZ to hopefully keep altitude at bay this time. As I said in the post, we just got it there at the place, there was no need to book anything in advance, there are plenty of tour operators that leave in the morning every day. My friend showed me a pic of the salt flats a day ago, i found this site today and now I’m going in February ;). Yah …u did inspire me .. great work u. Welcome and thanks so much! Fantastic article and very comprehensive and useful guide. You really inspired me to go there. want to photograph a lot so I think a privet car would be better! I am going in late June. If I am coming from Lima, and want to go to Santiago after seeing the salt flats, would you recommend I fly to uyuni and have the 3 day tour end in Chile? Can I pick up the train there or is there another mode of transportation to continue onward? thanks! we are planning a holiday covering Chile from North to South in next January. Do you think both Uyuni salt flats + Atacama desert flats are both worth it? Or just the Atacama flats are equally stunning? Uyuni is definitely a must imo! Such an informative posting, just wanted to say thanks! But i want to Know is it necessary to take yellow fever vaccination before visiting the salt flats and laguna colorado. I love your blog and especially this write up which is so so useful. I’m thinking of doing the 3D2N salt flat tour and getting dropped off in San Pedro. Just wondering, is the landscape of the salt flat tour similar to that you will see on tours in SP to Valle de la Luna, geysers, lagoons etc? If that’s the case I’m thinking of just doing a day trip to salt flats as it is much cheaper. Thank you so much for your help in advance. I am planing travel Central and South America after a short trip in US in May. 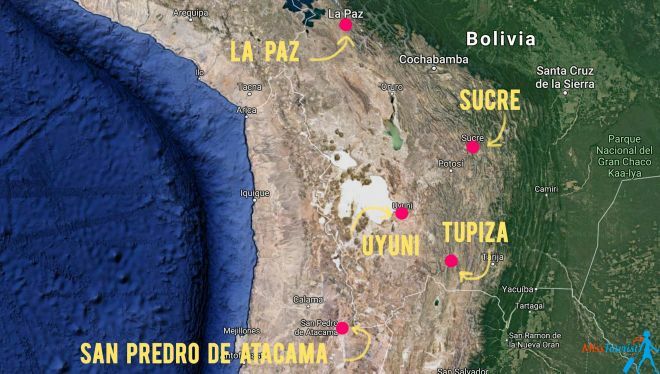 I will go through Colombia, Ecuador, Peru and other countries in between before heading Bolivia (around August or Sept) then end up in Chile for 4 – 5 months. My questions are 1) how easy to book 3-4 days salt flat tour as for single person (I do not know any Spanish). 2) is safe to join any tour on my own without knowing anyone in the tour? If you will take a 3-4 days 4WD tour, you will usually be with 5-6 other people in the car and it is safe to be just by yourself there – maybe some of the other travelers can understand Spanish! I am thinking of a self drive starting in Sucre.I can drive to Uyuni,in the first part of the trip ,and to Potosi,I the second part. If you believe that orientation is a big problem,can I ask(and of course pay)a driver of an organized tour to let me follow him? If that’s not feasible,is it easy to find guides in those cities? 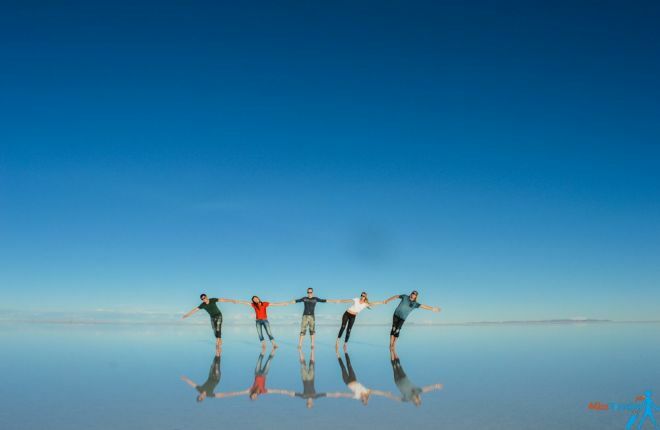 Not sure if you are asking about the orientation in Uyuni Salt flats? while the tour is pretty standartized and I think a driver would not refuse for you to follow the road, you still will need to book those hotels beforehand (they do not have websites) and organize your food and water yourself. I am planning to travel around Peru for 12 days but would also like to go to the salt flats, Atacama and maybe wineries in Chile before flying out. Where did the tour drop you off and how did you get around Chile? My tour ended in San Pedro di Atacama, Chile but you can choose your ending point depending on the type of tour you choose – Uyuni, Tupiza etc. Regarding getting around in Chile – there are buses that you can take but I can also recommend renting a car in case you have an international driving license! 1. Does the tour to Uyuni salt flats take you to the Desert of Atacama also? if not, how did you get to the DoA and how to get back to La Paz. 2. Getting a 3-day tour to the Salt flats in Uyuni is actually only around U$S100.00 for the whole three days or for each day? 3. Would it be OK for a single older woman to be traveling around that area by herself? • Start in Uyuni and finish the tour in San Pedro di Atacama, Chile. • If you are coming from Chile, you can start the tour in San Pedro di Atacama and finish in Uyuni (the other way around). Expect to pay more in this case (Chilean prices, you know ). • Start in Tupiza – this is the least popular option and these tours usually last 4 days. You will start from the Southern part of the salt flats and do the itinerary in reverse. At the end, you can return from Salar de Uyuni to Tupiza. • You can even start in La Paz or Sucre if you want a short private one-day tour. 2. Usually the prices for tours you can find online indicate the total price, so for the whole 3 days. You need to pay extra only if you want extra facilities or an English-speaking driver, for example. 3. Yes, I think it is okay to travel alone, as you will be accompanied anyway by the other travelers, which can be a very nice experience and many people do it!